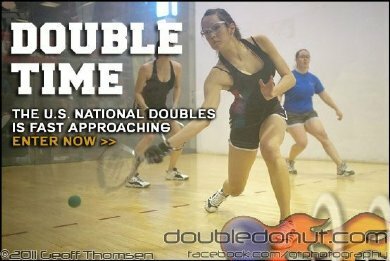 The 2013 USA Racquetball National Doubles Championships will be held in Tempe, AZ on the campus of Arizona State University. This is the sport's premiere doubles tournament and everyone is invited to play. The tournament is presented by Head/Penn and offers doubles divisions for skill, and age+skill for men and women. To enter online, click here. NOTE: The Palms Hotel sold out last year so please reserve your room early. Players may also reserve rooms at the Four Points Sheraton. The 2013 National Doubles will also be offering the division, the Centurion Doubles, (Open, A and B divisions) the combined age of both players that must add to be at least 100 years of age or more. The event is used in Michigan, Texas and other states with great success. This allows a number of fathers and sons to play together as well as coaches ...and mentors with students. Please note that parking at the venue is very limited and very expensive. Players are encouraged to stay at the Twin Palms Hotel and theFour Points Sheraton (newly remodeled) which is less than one mile from the facility. Players are also encouraged to check and verify the day their divisions are scheduled to begin. Click the Info link to see the list of times. Players must be prepared to play on the first day indicated by their divsisons starting date. Avoidances will not be allowed for players who ask to start on a different day. We hope you can come out and play in one of the sports premiere doubles tournaments of the year in a beautiful city at a gorgeous facility. The 2014 UnitedHealthcare US OPEN Racquetball Championships is COMING SOON! Don't miss the greatest event in the sport.